Resolutions: Eating more veggies and finding a tent of my own. At the beginning of December, I was ending each night with the bright light of my iPhone reading my newsfeed, which included some uplifting stories, but mostly included shared articles about how the world was ending, everyone’s opinion about EVERYTHING, and a great deal of sarcasm/defeat/anger/uncertainty. I decided to leave Facebook for a minute and headed over to YouTube (I know, I know…baby steps, y’all). On YouTube, I discovered a treasure trove of videos about essential oils, DIY whipped body butters, and vegan chefs whipping up fake eggs and flaxseed gel. It was a land I’d never discovered and I continue to find it fascinating and soothing. Next thing you know, I’m buying beeswax, shea butter, and diffusing lavender and frankincense like nobody’s business. But because this is a food blog, I’ll focus on food for a second. For my loyal Food Revival readers, perhaps you remember why/when I started this whole thing. I think it was in 2009? I was just laid off from my job at Southern Progress/Time Inc (RIP). During this time, I was volunteering for Jones Valley Teaching Farm and in exchange for my work, I received a box of veggies each week. I called each post my “CSA Challenge.” This is when my Birmingham freelance/nonprofit/food/volunteer journey began. Most nights were spent researching new recipes while my husband took photos of each dish for this blog. Let’s be honest, we were also doing a lot of googling (e.g. “what is kohlrabi?” “how do you cook a rutabaga?” “why do beets taste like dirt?”). Here we are nine years later and you will find me (on most nights) picking up the 2-year-old from day care, inching and navigating our way down Highway 65, calling my husband to ask him to throw a Homerun Pizza in the toaster oven, and moving through the bath time/bedtime groundhog day activities. So now that I work for Jones Valley Teaching Farm, you’d imagine I would have conquered the kohlrabi, rutabagas, and beets. Nope. My 2017 food accomplishments revolve around Homerun Pizzas, Queso, and Banana Sandwiches (don’t ask). HOWEVER, my new-found fascination with vegan YouTubers and the lingering effects of too much lavender and frankincense has inspired me to change this in 2018. 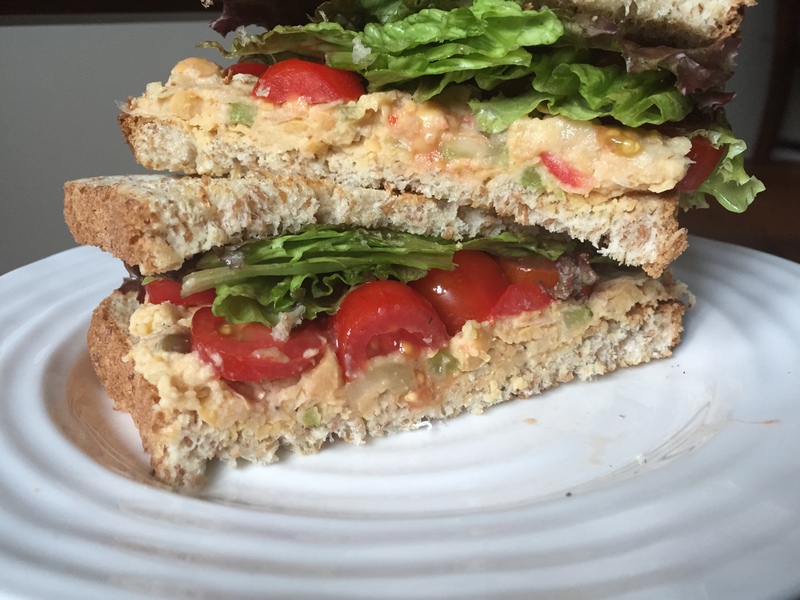 I also adapted THIS Chickpea Salad. I used pumpkin seeds instead of sunflower seeds. I also used the hummus garlic sauce instead of mayo/mustard. I’m really happy with how it turned out and will be spreading this on my sprouted bread a little later today. Eat more veggies from the Farm. It’s a job perk. The veggies are amazing. TAKE THE JOB PERK, AMANDA. Then document the recipes and experiences on Food Revival. You love doing this. DO WHAT YOU LOVE, AMANDA. P.S. Just wait until I post about my DIY whipped body butter. Wishing all of you a HAPPY NEW YEAR filled with frankincense, rutabagas, and a tent to hide in. Exciting Food -Focused Community Events Next Week!